, an eminent dissenting teacher, and a voluminous writer, was the son of the foregoing, and born in 1662. He continued under his father’s eye and care till about eighteen; and had the greatest advantages of his education from him, both in divine and human literature. He was very expert in the learned languages, especially in the Hebrew, which had been made familiar to him from his childhood; and from first to last, the study of the scriptures was his most delightful employment. For further improvement, he was placed in 16SOat an academy at Islington. He was afterwards entered in Gray’s-inn, for the study of the law where he went on with his usual diligence, and became acquainted with the civil law, and the municipal law of his own country. His proficiency was soon observed; and it was the opinion of those who knew him, that his great industry, quick apprehension, tenacious memory, and ready utterance, would render him very eminent in that profession. 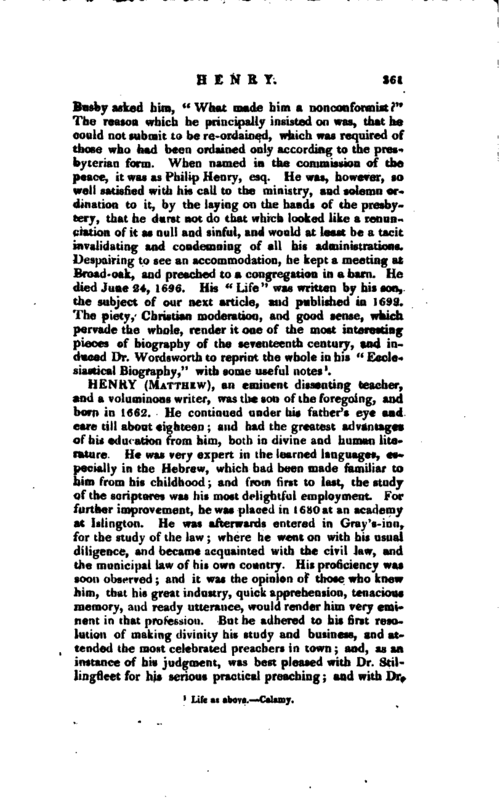 But he adhered to his first resolution of making divinity his study and business, and attended the most celebrated preachers in town; and, as an instance of his judgment, was best pleased with Dr. Stillingfleet for his serious practical preaching; and with Dr. | Tillotson for his admirable sermons against popery, at his lectures at St. Lawrence Jewry. In 1686, he returned into the country, and preached several times as a candidate for the ministry with such success and approbation, that the congregation at Chester invited him to be their pastor. To this place he was ordained in 1687, where he lived about twenty-five years. He had several calls from London, which he constantly declined but was at last prevailed ou to accept a very important and unanimous one from Hackney. 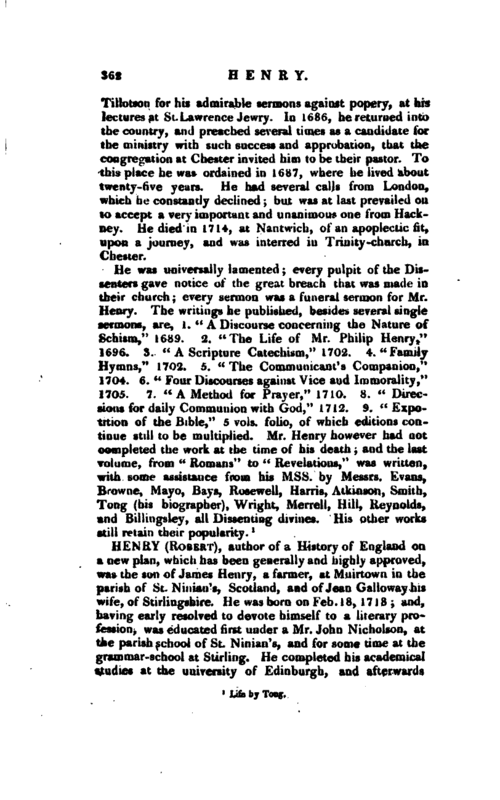 He died in 1714, at Nantwich, of an apoplectic fit, upon a journey, and was interred in Trinity-church, in Chester.